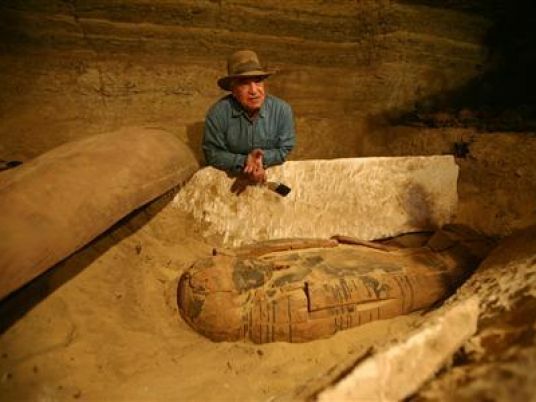 Egypt’s former Minister of Antiquities Zahi Hawas said during an interview with Egyptian presenter Amr Adib on his show “Al-Hekaya” (The Story) that the Italian news concerning the discovery of Cleopatra’s tomb is completely fake. Hawas stated that Italians have been searching for the Mark Antony/Cleopatra tomb for almost 12 years now. He added that Dominican archeologist Kathleen Martinez has a theory that Cleopatra and Mark Antony are buried next to each other. Concerning the real discoveries, Hawas mentioned that during his presence at the Ministry of Antiquities, he, an Egyptian team and Martinez had been excavating at the Temple of Taposiris Magna about 45km west of Alexandria, where they successfully discovered various metal coins and a great number of objects, including the foundation deposits, that showed that the temple was first built by Ptolemy IV. The team also found an emblazoned stone that was a gift from Ptolemy V, the king who made the Rosetta stone. The story began when Hawas was giving a lecture at the University of Palermo in Italy and said, “If we succeeded to discover the location of the tombs of both Cleopatra and Mark Antony, that would be such an incredible discovery for both Italian and Egyptian people.” It is worth mentioning that Cleopatra was Egyptian, while her lover Mark Antony was Italian. When he returned back home from Italy, Hawas was surprised to find one of most prominent Italian newspapers saying that Hawas announced the discovery of the Mark Antony/Cleopatra tomb, which is completely false. Hawas denied this news, asking why he would make such a big announcement from Italy and not Egypt. Cleopatra is one of the most popular queens in ancient history and she is regarded as a mysterious woman. Cleopatra is such an elusive character who has received much attention from diverse filmmakers and writers, especially the “Tragedy of Cleopatra and Anthonie” by Shakespeare. Cleopatra was also the lover of Roman emperor Julius Caesar. This is why she is regarded as a noticeable icon in the history of both Egypt and the Roman Republic. Hawas also mentioned that Hollywood is currently producing a film featuring Cleopatra, who has Greek roots. He recommended that American star Angelina Jolie play this role, for Cleopatra is such a strong character.